GlycoRec Partners (f. l. t. r.): Jan Raacke (PFH), Prof. Dr.-Ing. Dominikus Heckmann (OTH Amberg-Weiden), Dr. med. Janko Schildt, Dr. med. Markus Bentrup (beide Emperra), Dr. Eelco Herder (L3S), Prof. Dr. Stephan Weibelzahl (PFH) und Markus Rokicki (L3S). Nicht im Bild sind Prof. Dr. Karsten Müssig und Dr. Olaf Spörkel (beide DDZ). To help patients with diabetes to make complex decisions in their daily lives and to implement resolutions is the aim of the "GlycoRec" research project. It is an adaptive learning system, also referred to as interactive bio life logging. The coordination centre for the project funded to the tune of 1.4 million euro by the Federal Ministry of Education and Research (BMBF) is located in the Department of Business Psychology at PFH Private University of Applied Sciences. Other project partners include Emperra GmbH E-Health Technologies from Potsdam, the L3S Research Centre at Leibniz Universität Hannover, Ostbayerische Technische Hochschule Amberg-Weiden and the German Diabetes Centre. At the beginning of February 2015, the research project embarked upon the implementation phase. Diabetes mellitus is the most common chronic disease in Germany. About ten percent of the population are affected by it, with a further increase being expected. Even now, diabetes is one of the most frequent reasons for consultation in general medical practices and, in the foreseeable future, it will no longer be possible to meet the demand for consultation owing to the increasing number of cases. At the same time, it is important for patients to act correctly to avoid complications. Overall, patients therefore need to make many daily decisions, relating, say, to dietary habits, blood sugar level status and required insulin dose or general lifestyle. Older patients, in particular, and those for whom the disease has only recently been diagnosed therefore soon feel overwhelmed in their daily lives. 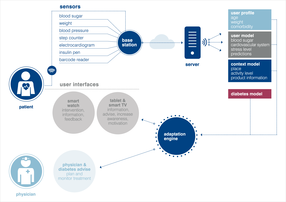 This is where GlycoRec (from "glycose" and "recommendation"), which is designed to assist diabetes patients with their decision-making in their daily lives, steps in. GlycoRec collects individual patient data using a series of physiological sensors (e.g., blood sugar, body weight, blood pressure) and information about the individual context (at home, out and about, at the supermarket, weekday, time of day, meta-information about food). An analysis of the current situation is then carried out. This can be utilised in two ways: First, the patient can take the initiative and ask for help with a decision. An interactive consultation dialogue enables the patient to compare alternatives for diet, activities and medication intake and to run through their consequences. Second, the system can also take the initiative because, for instance, the predicted values risk exceeding a tolerance range. The patient can also weigh individual options against one another in this case. The user can access this information using a smartphone while out and about or at home using smart TV, according to his or her preference. The GlycoRec project is investigating how to give patients better support in their daily lives. The continuous collection, storage, processing and analysis of physiological and environmental data enables individual user and context models to be developed. These make it possible to provide much more accurate forecasts and individual recommendations for the patient. GlycoRec provides an extendable, integrated infrastructure consisting of sensor technology, modelling and patient interaction. In order to make an infrastructure of this kind available, it is necessary to develop new technologies and methods in sensor engineering, modelling and user interaction. These will help to make patients better able to deal with their disease and to reduce complications. In this respect, GlyoRec is interactive biolife logging for a more comprehensible approach to diabetes. The project team is planning to have developed a prototype within three years. Dr Stephan Weibelzahl, Professor of Business Psychology at PFH, is the project applicant and coordinator. He and his team are responsible for developing interactivity and the user interface. 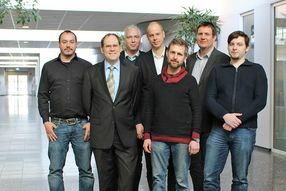 Emperra E-Health Technologies from Potsdam, which is contributing the server infrastructure for a central database and a part of the sensor technology hardware, is the project's technology partner. Ostbayerische Technische Hochschule Amberg-Weiden is developing and testing novel sensor technology in terms of its use for data modelling. The L3S Research Centre at Leibniz Universität Hannover is working on algorithms for the automatic analysis of patient data. Lastly, the German Diabetes Centre, as an application partner, is ensuring access to patients and hence an assessment of relevance.